Officer and senior clerk jobs. 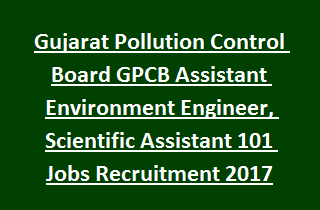 There is total 101 vacancies in this GPCB Recruitment 2017. Online applications only accepted for this GPCB Vacancies Recruitment through Ojas website or www.ojas.gujarat.gov.in. Last date for online application submission for this GPCB AEE, Scientific Assistant Jobs is 10-11-2017. Online link will be active from 16-10-2017 for this GPCB Recruitment 2017 Notification. Candidates will be shortlisted based on merit in written examination for this GPCB Assistant Environment Engineer, Scientific Assistant Jobs. More details about this AEE, Scientific Assistant Posts of GPCB Recruitment are given below. There are total 101 vacancies in this Gujarat Pollution control Bank Recruitment. Post Wise vacancy details are given below. Application fee is Rs.100 and postal service charges are Rs.12/-. Pay the application fee in E payment post offices only. Candidates will be selected based on marks in written examination and interview for these Gujarat Pollution Control Board vacancies Recruitment 2017. Written exam will be conducted for 300 Marks and consists or two different papers. For Junior Clerk jobs Paper 2 will be Computer proficiency test and Computer Practical Test. Computer proficiency test will be Gujarati and English Typing test and Computer Knowledge Test. Download Exam syllabus here in PDF Format for GPCB Assistant Environment Engineer and Other Jobs. Apply online only for this GPCB Recruitment of various jobs on or before 10-11-2017 through Ojas recruitment website. After completion of application form online pay the fee in E post offices before the closing date. And then download exam syllabus for the post which you applied. Start preparation as early as possible.